I’ve been wanting to get paw paws in the ground for a while. L got three and made sure it would work in the Cistern Garden. Custard apples are an edge species native to North America and mostly found in the eastern U.S. both North and South. George Washington ate them for dessert. In the Pacific NW the problem is slugs. The hungry devils girdle saplings whose bark hasn’t toughened up. Slugs don’t like copper, at least fresh copper without a patina. 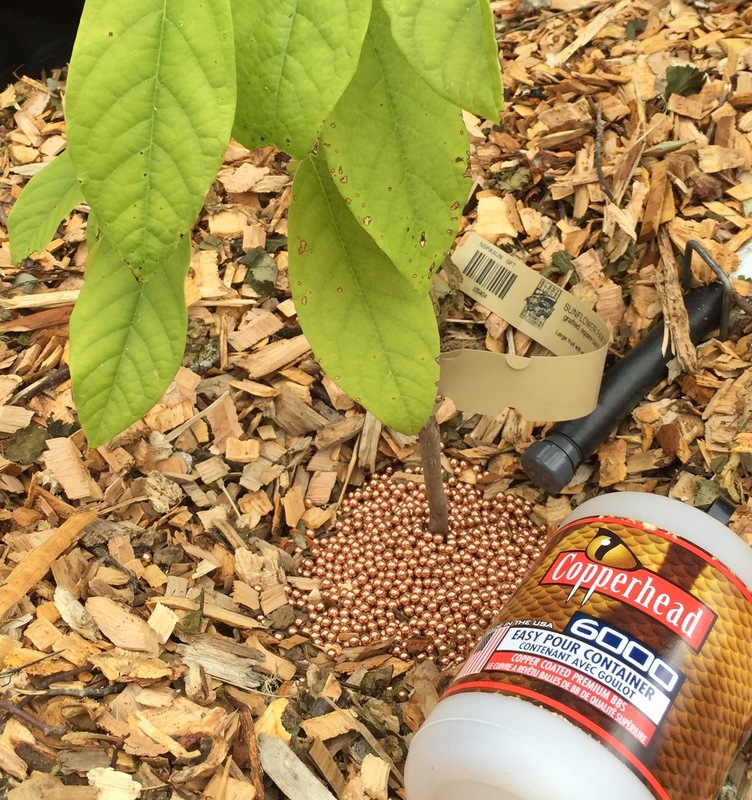 In the past I’ve hammered used copper pipe flat and made rings to protect young hostas. I had problems with slugs going under the rings on uneven ground. Solution… BB’s. I think a wide pool of copper coated BB’s might keep slugs at bay. 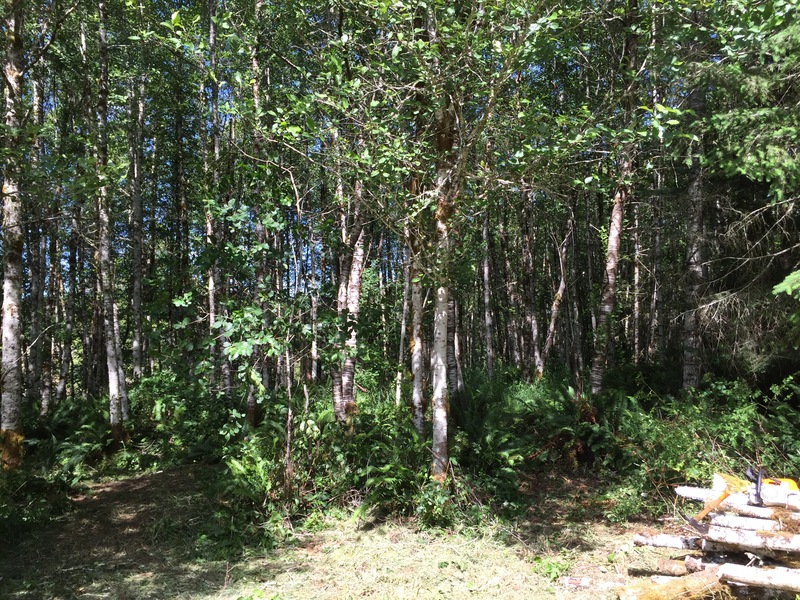 There is shade cloth on our baby trees so the metal shouldn’t super heat and roast the trunks. I also have a big magnet I use on our fire ash to extract the occasional nail that might get repurposed when the mulch gets redressed. I think it could work. Maybe? I hope. Most of the plantings went into the newly fenced Cistern Garden. Luckily they will not have to suffer like the previous plantings we’ve done on the farm. 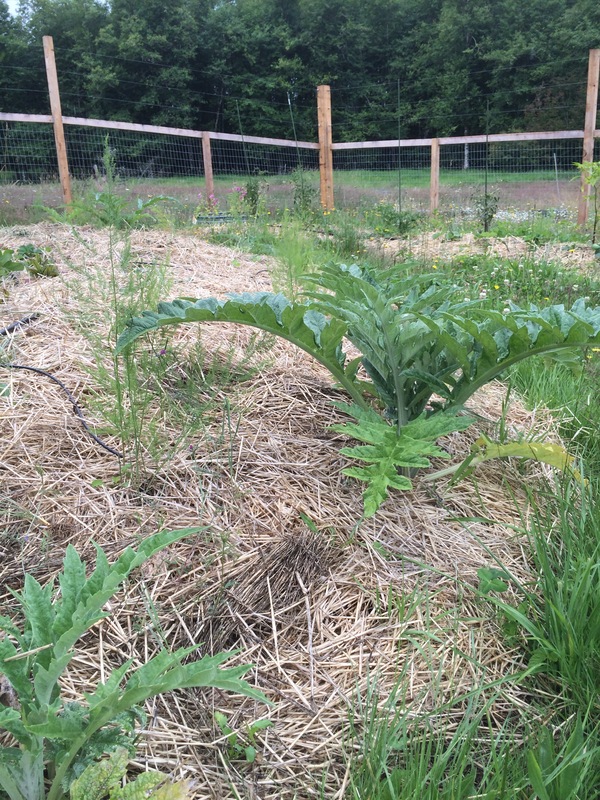 It took us a while to realize that plants actually grow much better when not being constantly munched by deer and rabbits. Tennosui – an Asian Pear cross with the texture and flavor of an Asian pear but bell-shaped like a European pear. I love the flavor of Asian pears but for some strange and inexplicable reason I prefer the shape of the European pear, so this could be the perfect pear for me! 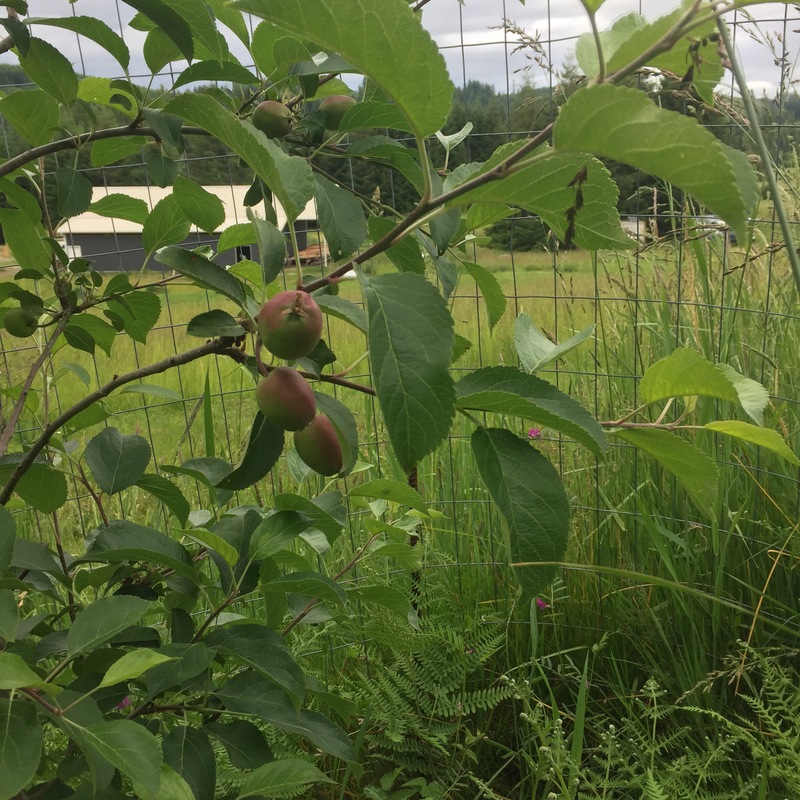 Seckel – I like the look of these sweet little pears. The idea of “snack-sized” fruit appeals to me. Sometimes I’ll pass on an apple or pear because I don’t think I will eat the whole thing or if I just want to add a little fruit to a green salad. 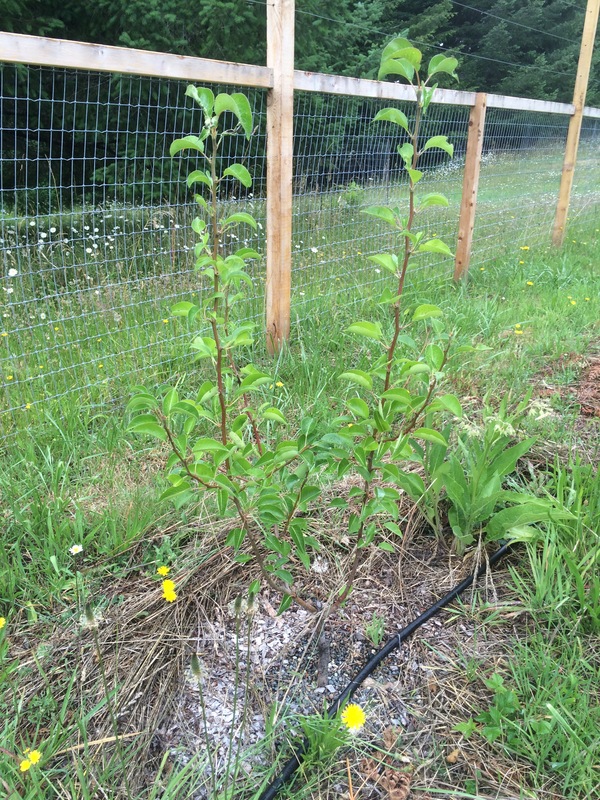 The other two existing pears in the Cistern Garden, an Orcas and a Honeysweet, were transplanted at the same time as the Bartletts. We moved them from our upper swale when we replaced the apples we lost. 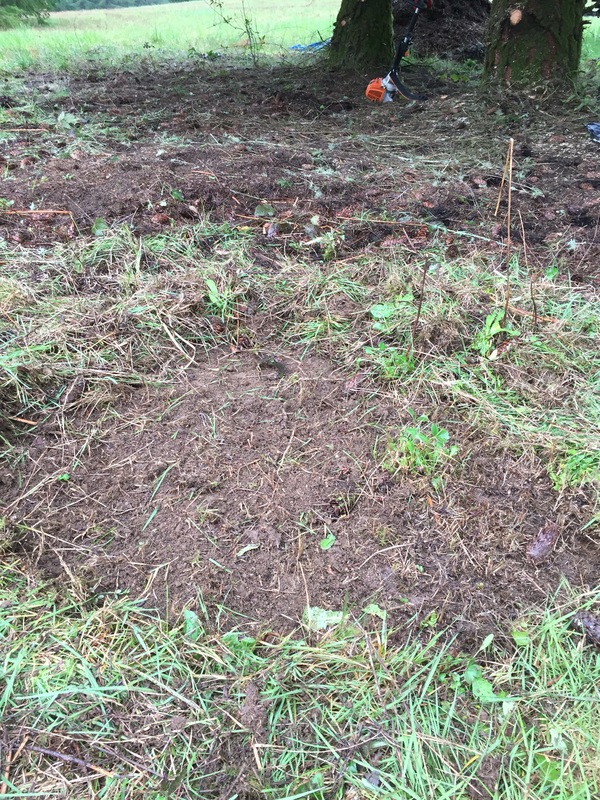 Since the pear and plum trees were a little worse for wear from deer munching and our near fatal attempt at home-brewed deer repellant we figured it was “do or die” anyway, so why not go ahead and move them and just add more apples to the upper swale. Well, I’m happy to report they seem to be recovering quite nicely. 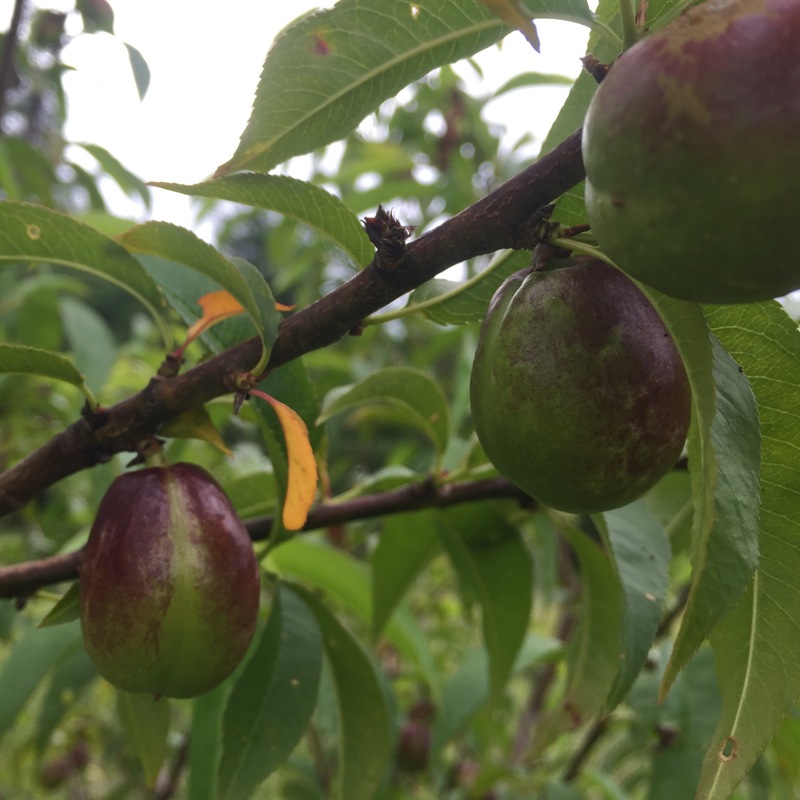 Joining the Schoolhouse and Early Laxton (pictured below) plums we transplanted at the same time and for the same reason as the aforementioned pears, are four new varieties – Satsuma, Toka, Black Ice and Imperial Epineuse. Unfortunately the Imperial Epineuse never budded up and having confirmed it is actually dead, Burnt Ridge is giving us a replacement. The Early Laxton has done well since the transplant and was loaded with beautiful, albeit tiny plums. The fruit is supposed to be “medium size” but I can’t find anything in my books or online as to why they are so tiny – about the size of a fifty cent piece, some only a quarter. Regardless of size they are quite delicious. 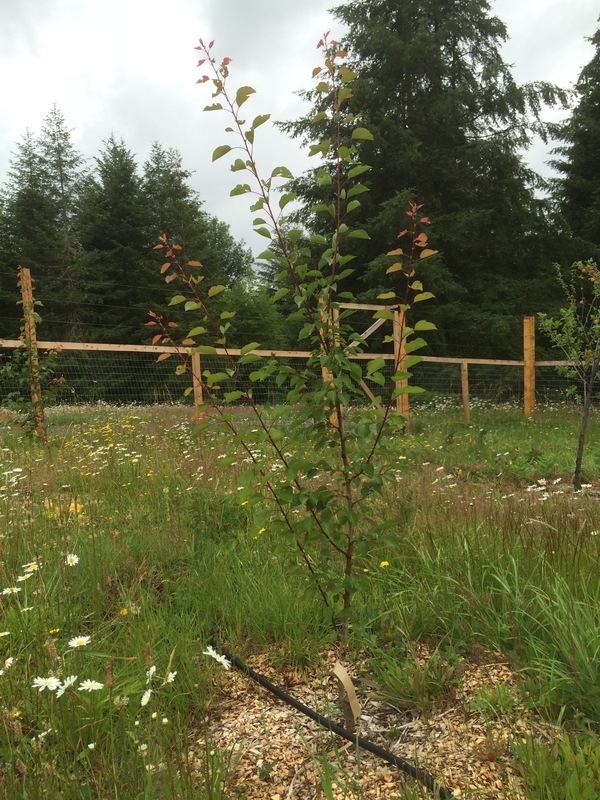 We left the Contender Peach and the Hardired Nectarine in place at the upper swale since they were just about the only trees that had survived the deer, etc… and had grown so large we didn’t think it was wise to move them. Although they both get peach leaf curl, they are loaded up with fruity goodness this year, so I think we made the right decision to leave them. 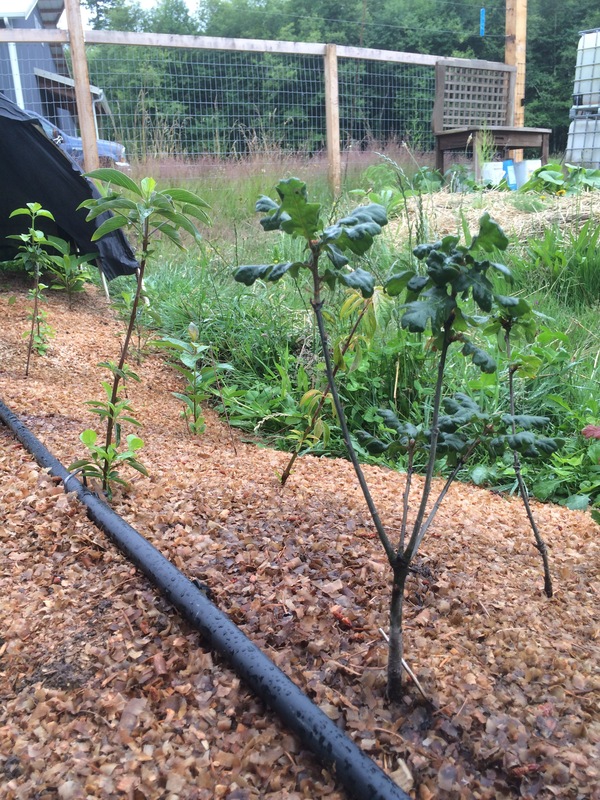 We added one Indian Free and two Charlotte peaches to the Cistern Garden, both of which are leaf curl resistant varieties. 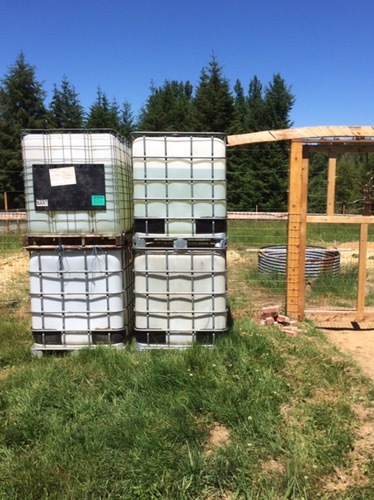 I know – sounds a little ambitious (or just plain daft) that we are attempting to grow almonds in the Pacific Northwest, but we like to “experiment”. We do buy 98% of our fruit and nut trees from Burnt Ridge Nursery which is just under an hour from our farm. They specialize in nut trees and claim to only sell trees they can successfully grow themselves. I find that reassuring especially because they are at a higher elevation and colder than we are. Fingers crossed because organically, responsibly grown [and still affordable] almonds are hard to come by. Ever since we watched the PBS/Nature documentary Silence of the Bees we just can’t bring ourselves to buy them anymore. We have two Alenia and one Dessertiny. They are both hardy and late blooming so keep your fingers crossed we eventually get edible nuts. Growing up in Southern California where practically everyone had an apricot tree in their backyard, they are one of my favorite fruits. 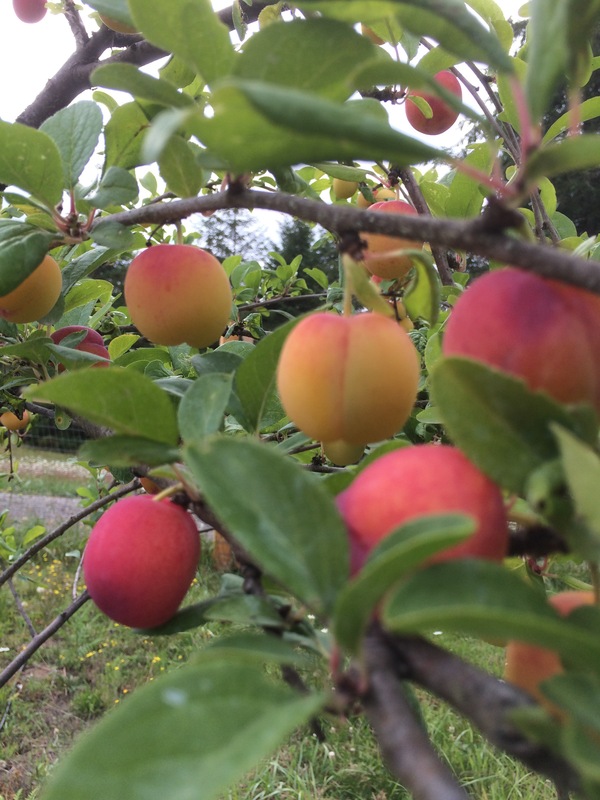 Planting apricots may be folly as I rarely get a Washington grown apricot that conjures up the flavor I recall from my youth, but I am ever hopeful. I [like to] think I have a better chance of achieving this as I won’t be shipping my apricots around and therefore can let them ripen properly on the tree. I chose Chinese (Mormon) and Montrose because they are late-spring bloomers. 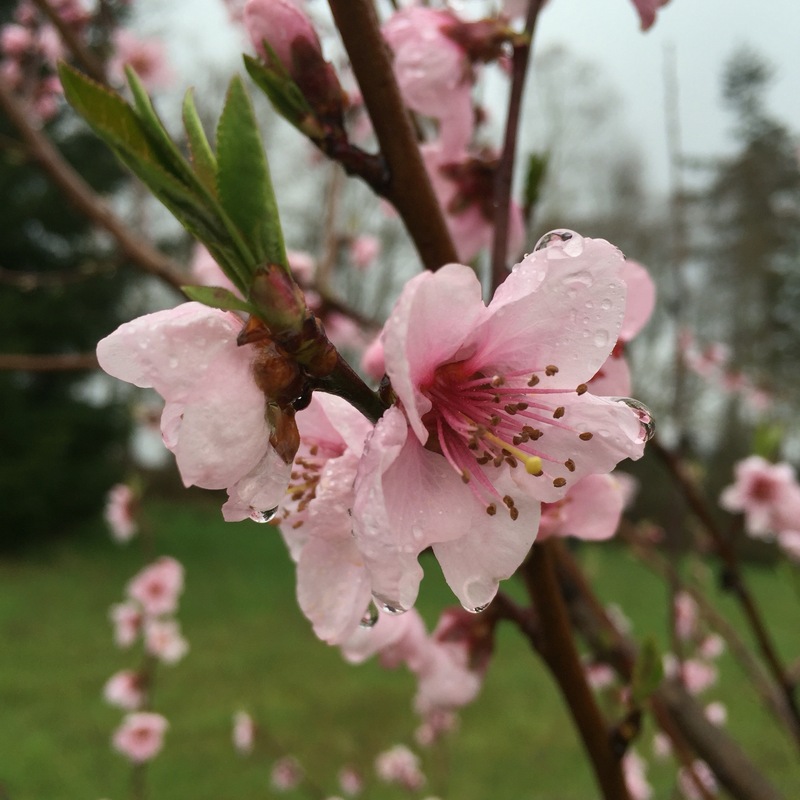 The Chinese apricot has frost resistant buds, is cold hardy and tolerant of wet soils. It has the added bonus of edible pits that apparently taste like almonds in the event our almond experiment doesn’t pan out. Ever since our trip to Italy several years ago (wow – it’s been “several” already???) 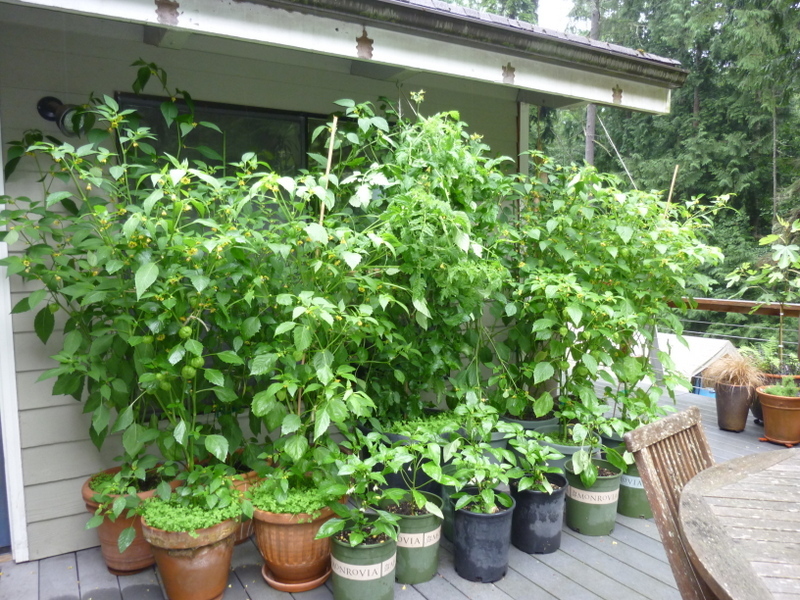 where we enjoyed fresh persimmon juice with nearly every breakfast, we’ve been determined to grow our own. Nikita’s Gift and Miss Kim sounded promising. Nikita’s Gift is a Ukrainian selection – a cross between American and Asian persimmon combining the larger fruit size of Asian persimmon and greater hardiness of the American parent. Miss Kim is early ripening. We have never tasted a paw paw but the description of them sounds divine – I can’t imagine not being totally infatuated with a flavor described as “sunny, electric, and downright tropical: a riot of mango-banana-citrus that’s incongruous with its temperate, deciduous forest origins” – can you? Besides we think we have a better chance at growing paw paws than bananas (M’s fav) and mangoes (my fav). We purchased two Sunflower – a hardy northern selection – and one Campbell’s No. 1 – a Canadian selection. If we can keep the slugs from eating them we might just get lucky. We’ve put them under shade cloth as they are also susceptible to sunburn when they are young. 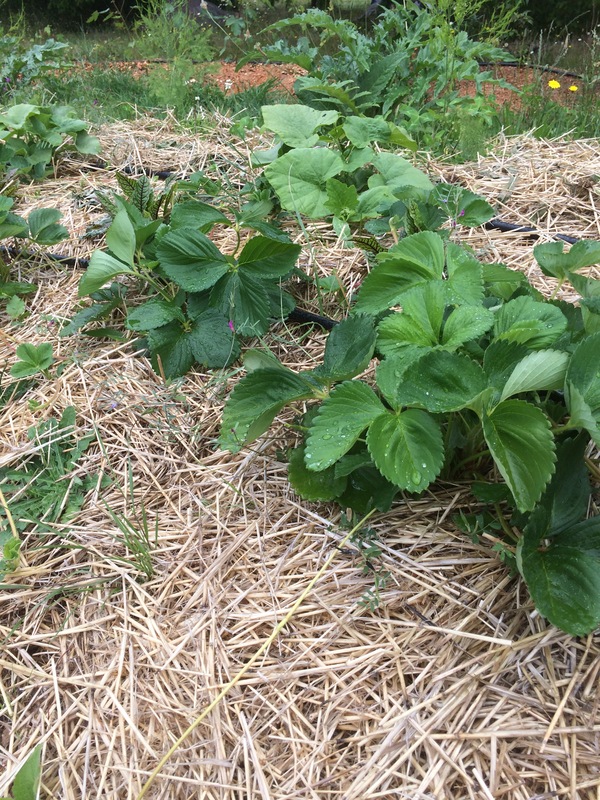 I planted out 25 each of Totem, Shuksan and Tristar strawberries. The Shuksan have gone crazy. They have the largest leaves I’ve ever seen on a strawberry. Must be all of that composted dairy cow manure. When the field mice and birds leave a few berries behind, I’ve been munching them as I weed the beds and they are super delicious. The Totem are smaller, but tasty too. Not sure what’s up with the Tristar – the fruits are tiny and misshapen. From my research it may be that they are not getting enough pollinator action. About two years ago a co-worker of M’s gave us a Golden Raspberry plant from their yard. I turned that into several raspberry plants and planted them in the Cistern Garden (before it was fenced and named). They were severely munched by deer (you may recall the deer mulch) and then the bear started eating them, so I dug them up and put them back in pots until the Cistern Garden fence was completed. They are back in the ground and now I’m up to 18 plants. 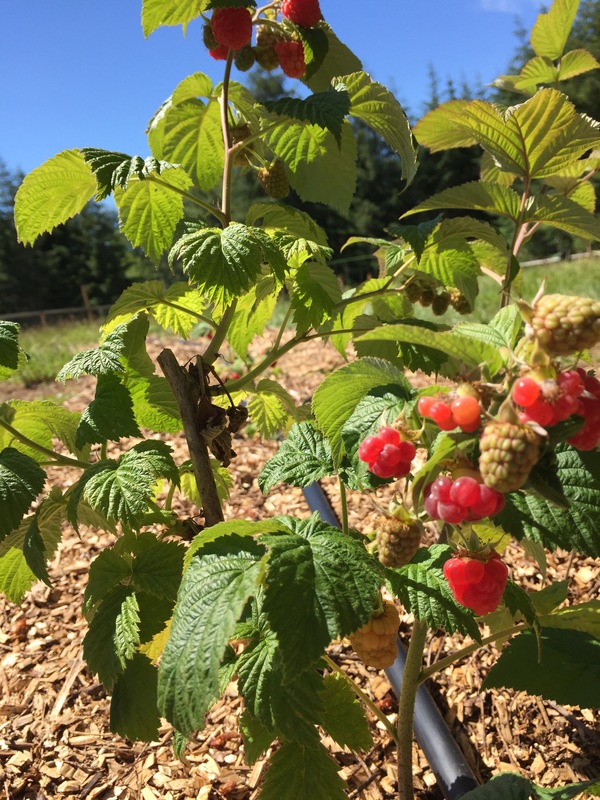 They just started fruiting but the fruit is red, not golden… I couldn’t find much about it online except that golden raspberries are a mutant version of red so they must revert back when propagated. Any raspberry propagation experts out there? I planted out the Asparagus and Artichokes I grew from seed at home and have been keeping in pots for far too long. They seem to be happy to be in their new home. I added 18 Bloody Sorrel plants I also grew from seed I saved from a plant I bought at a nursery years ago. 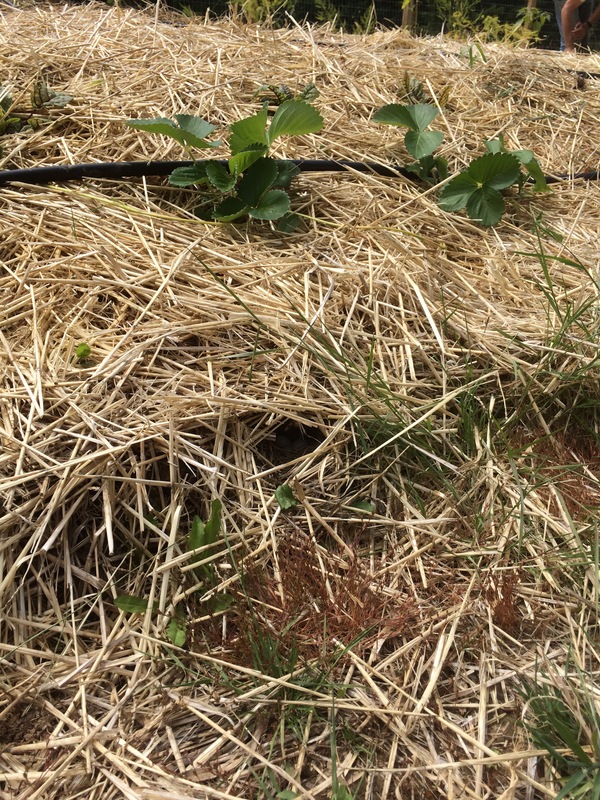 I save seed every year and plant out seedlings in the garden near our chicken coop – the chickens love it. 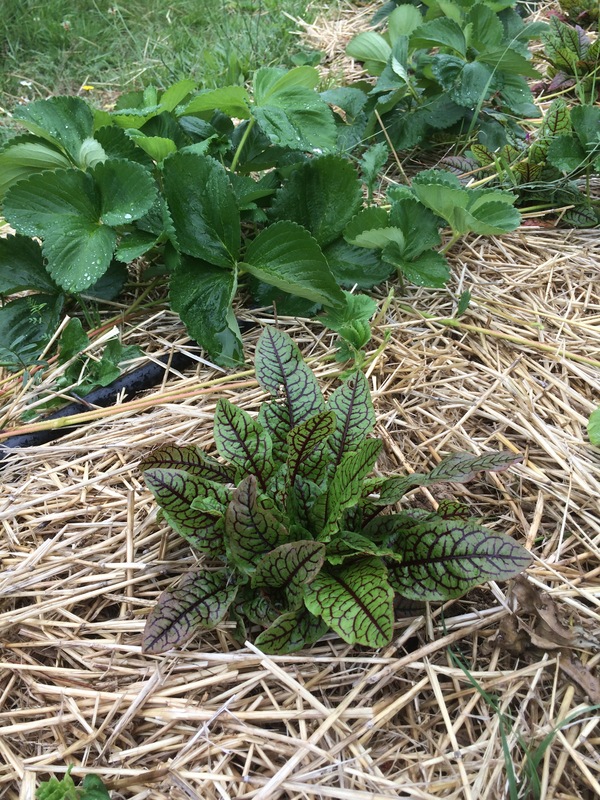 The bloody sorrel looks nice amongst the strawberry plants with their beautiful red veining and stems – especially when there were strawberries on the plants. 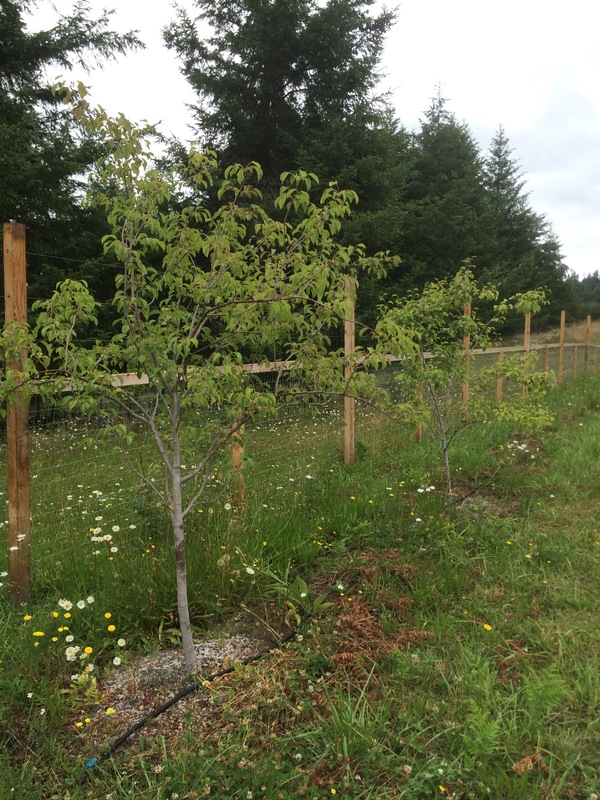 In the temporary nursery bed we built earlier this year we planted Pacific Dogwoods, Blue Huckleberries, and Oregon White Oaks from the Conservation Districts Annual Native Plant sale. We buy bare root plants from the sale every year but have not had the best of luck in keeping them going out in the “wild” parts of our property when planted out in early March so decided we will hold them in the Cistern Garden until they are a little bigger and then transplant them out in the fall. 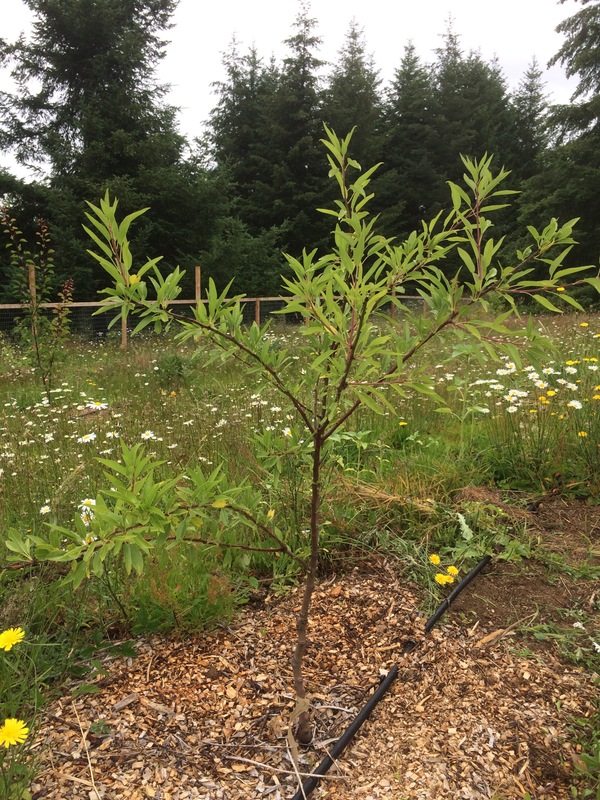 We planted out 10 Blue Elderberry as understory to the Douglas Firs on the east side of the Cistern Garden. 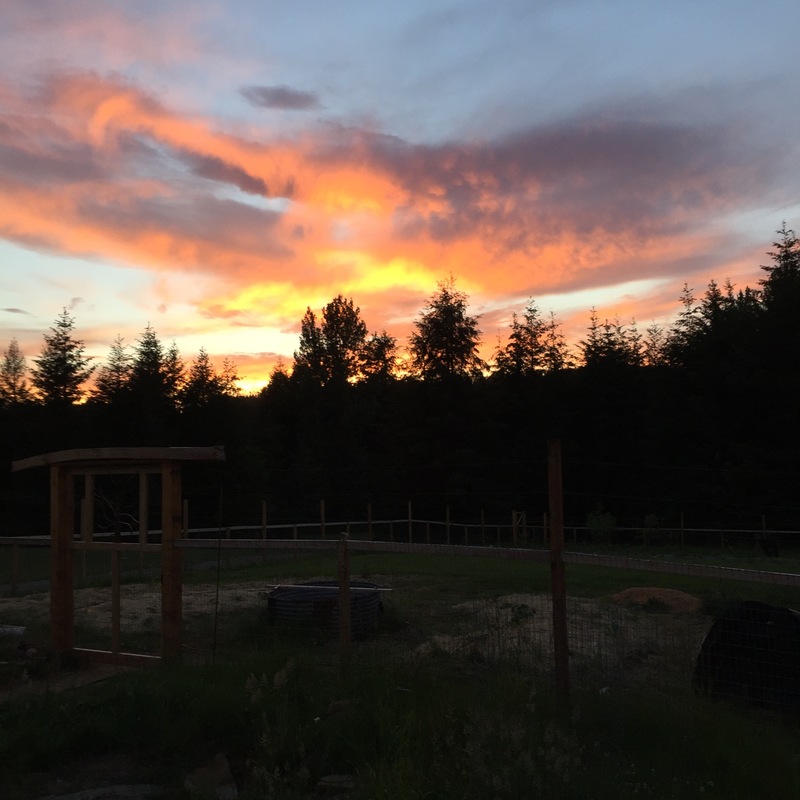 There will be a coop under the trees eventually – a small flock of chickens will be housed there to help maintain the Cistern Garden. On the other side of the Douglas Firs we hope to have a pond with ducks who will also be allowed access to the garden for slug patrol. 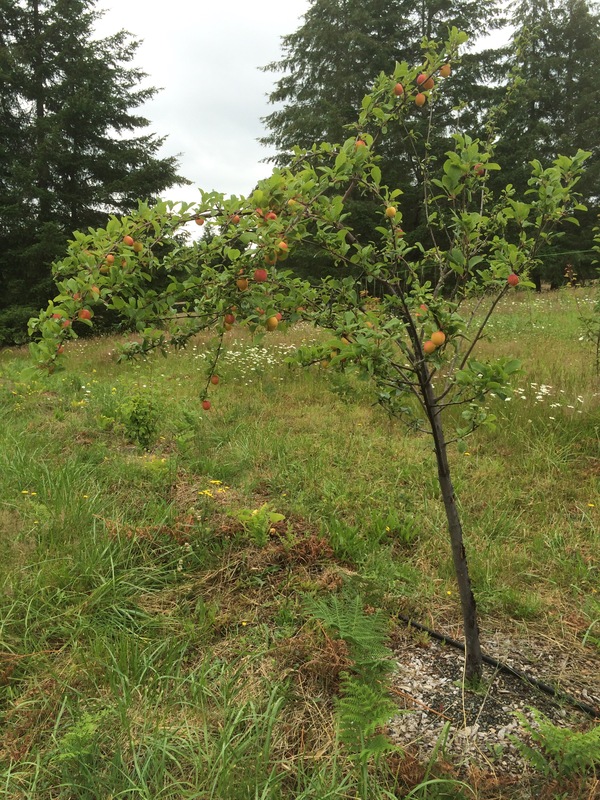 M planted out Noble firs in other areas of the property as part of our woodlot diversification plan. Some may become Christmas trees. This past weekend I transplanted 20 Big Leaf Maples I grew from seed that M collected last fall along the walking portion of his route home from work. We were going to plant them out in the woods in an area M was thinning alder from. I had left the buckets of seedlings sitting out overnight and the deer munched the tops off of a couple of them, so in the nursery bed they go until fall. 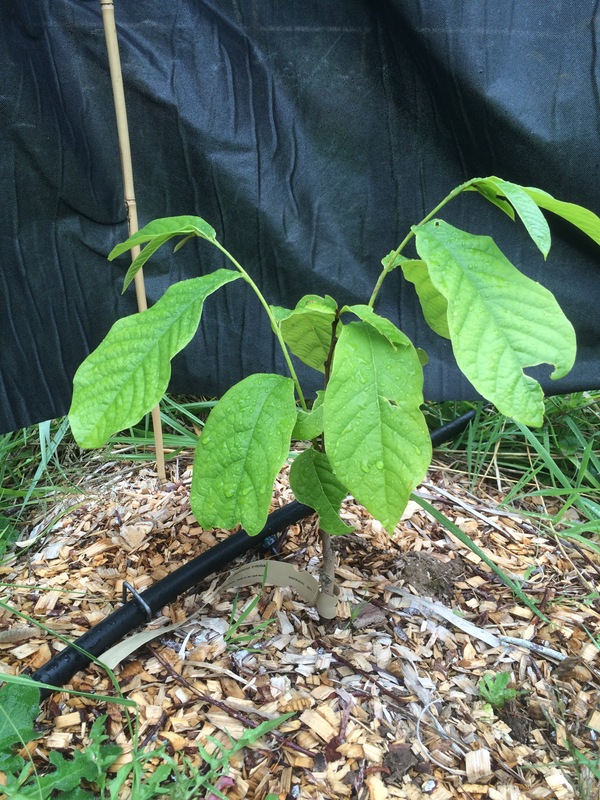 Other additions to the nursery bed are two Dwarf Black Mulberries slated for the Chicken Food Forest. They will stay here until that area is fenced. The Black Locusts we planted there two years ago have been taking a beating from the deer and rabbits, so no more plants go into that area until it has been fully secured. There are a couple of apples we started from seed in there too. 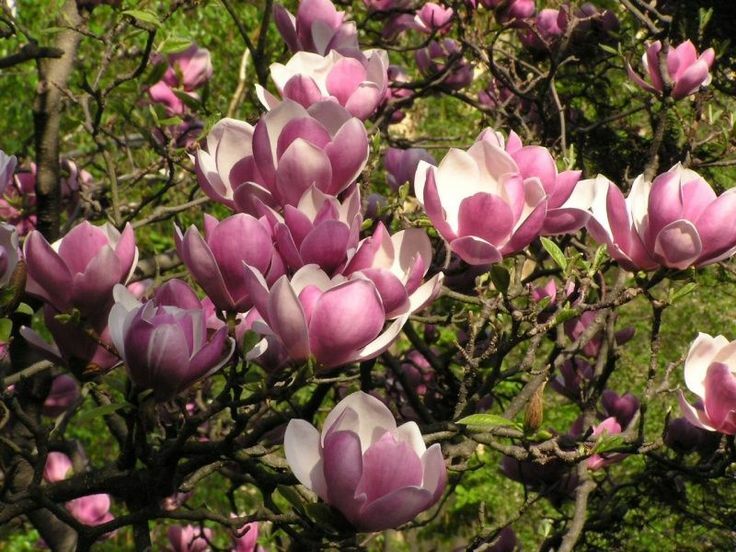 Back home we have a Saucer Magnolia that I saved seed from. I sowed a bunch of the seed and ended up with 20 or so seedlings. Rather than try to keep them in pots until we have spots for landscape trees, they are taking up temporary residence in the nursery bed. At home it so shady that I have to grow tomatoes and peppers in pots on our south-facing deck but that quickly becomes a nightmare – the seemingly non-stop potting up, having pots large enough to accommodate them, watering constantly, etc… so I passed on the last two years given that we are running back and forth to the farm and I have more than enough to do. But I miss the taste of home-grown tomatoes so much and organic heirloom tomatoes around here are $8 lb. 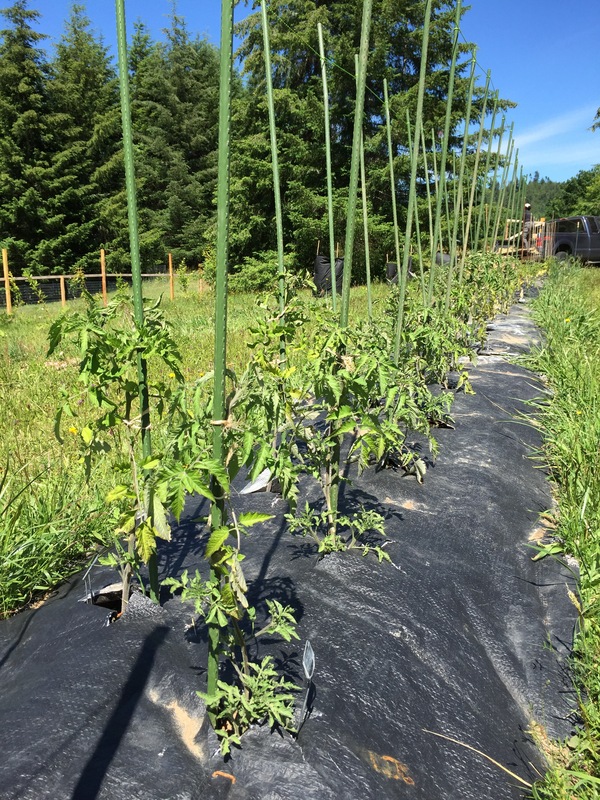 Well… setting up, testing, and re-testing the drip irrigation took up a little more time than we bargained for, but it’s done now and – here it goes again – “fingers crossed” we will enjoy beautiful, juicy, flavorful tomatoes this year. I built the raised bed earlier this spring and covered it with lumber wrap (a free source of tarps from your local lumber yard that seem to last longer than the classic blue ones you have to purchase) because we keep learning the hard way that everything around here gets swallowed up by the pasture grasses before you know it. We decided to go ahead and leave the plastic on after planting out since we are usually only here on weekends and already working frantically on a bunch of projects making weeding hard to keep up with. 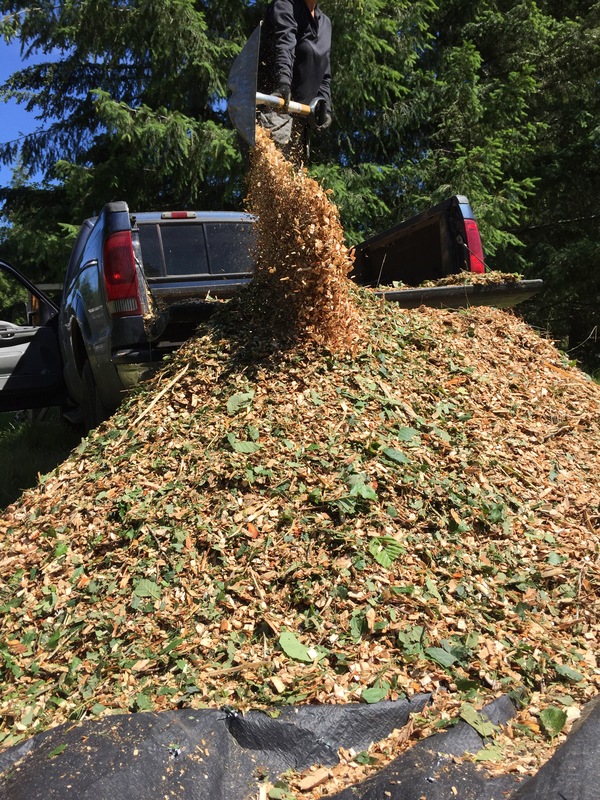 We are trying to stockpile alder chippings for mulching but seem to be using it up faster than we can generate it. You can only do so much in a weekend. 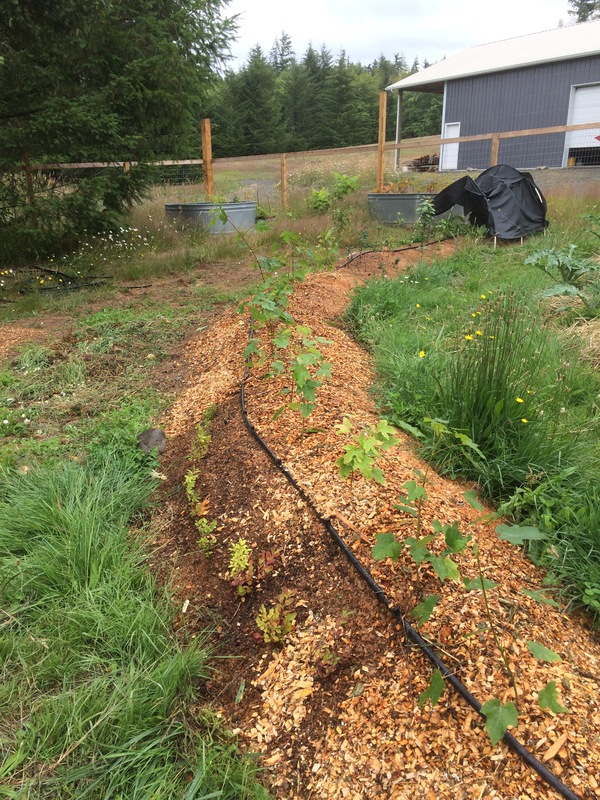 While we were hooking up drip irrigation for the newly planted trees, why not go ahead and plant some squash, pumpkins and melons in between to help shade out the weeds? Don’t want those seeds going to waste and since I have very little success growing these at home, any that we harvest will be a bonus. Fingers still crossed? Mine are starting to cramp up. 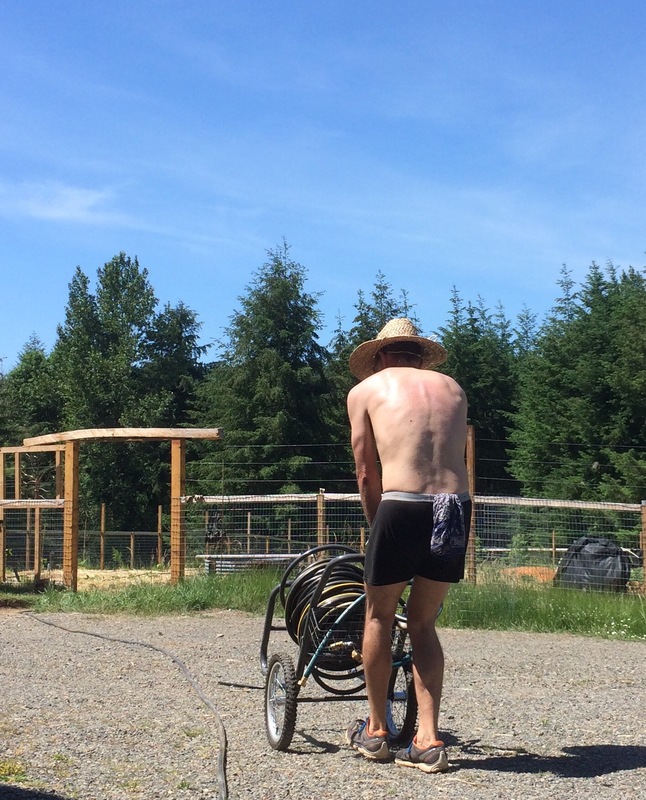 Long distance farming – not for the skeptical. Forest management. Seeing the trees and the forest is a skill for sure. Zooming in and out not only on what is in front of you but also what is now and what it will become in 20 and 30 years. 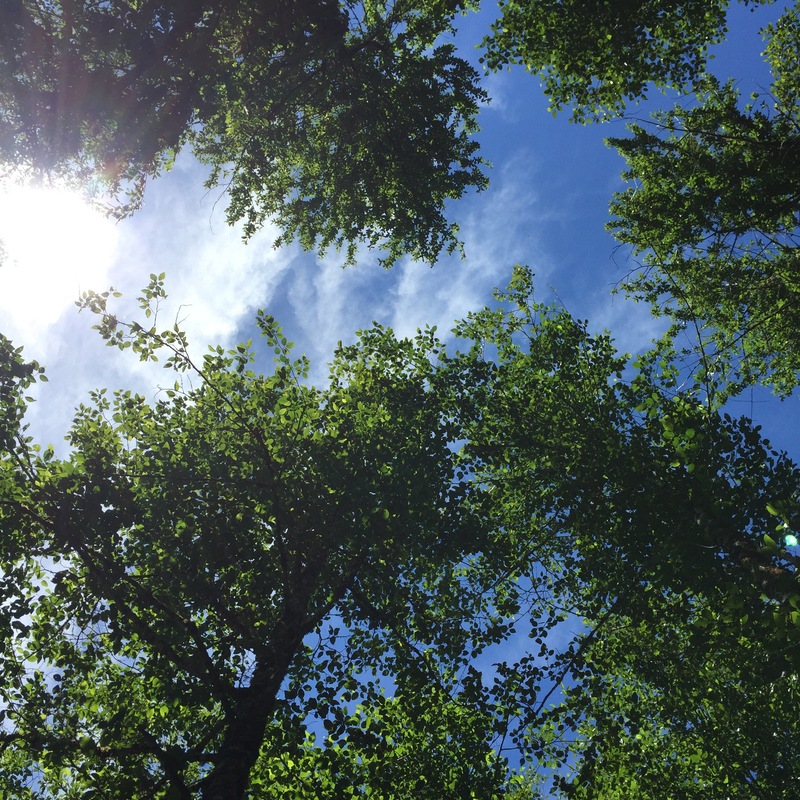 We are always observing with an eye on understanding life expectancy and transition from pioneer species like our cherry and alder to apex species like cedar and maple. Observation is great but it is most useful informs action. This is like thinning really big carrots, and the scale of it is a little daunting. One day’s work allows me to cruise and actively thin an area about 400 feet square. It is hard to see the difference. First out are the little guys with no chance of getting leaves up into the canopy. 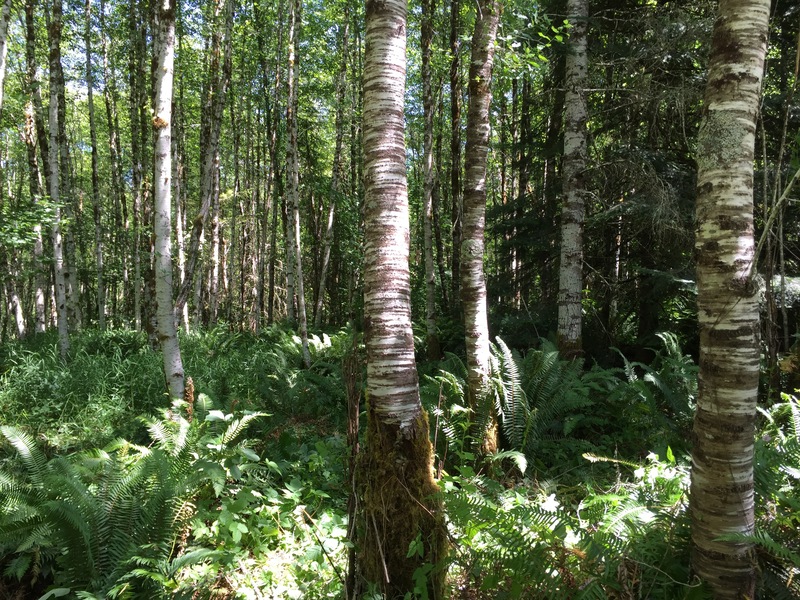 Shade tolerant species stay put since they represent the successional canopy as long as they get enough light to stay healthy. We spend a lot of time looking up, then looking out. All this gets done by hand, so bucking logs into lengths I can carry is the rule. Stumps get cut even with the ground, tops get chipped for mulch projects. I try and leave about a third of the volume of wood in place and in contact with the soil. 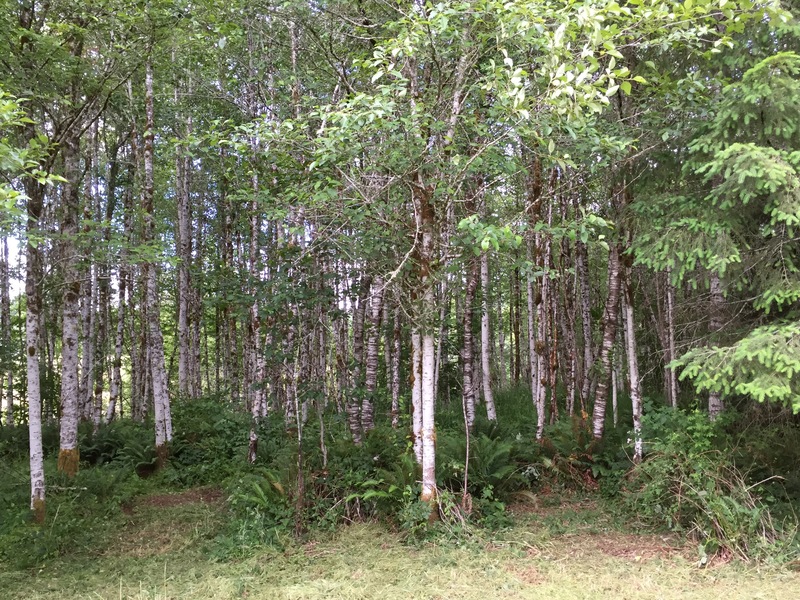 Doing that builds soil fertility by adding organic matter and alder roots will begin to release nitrogen in the coming year or two (red alder is a nitrogen fixer). How many tools does it take? The more tools the harder the job, right? A tape measure is handy too as is my roofing hatchet. 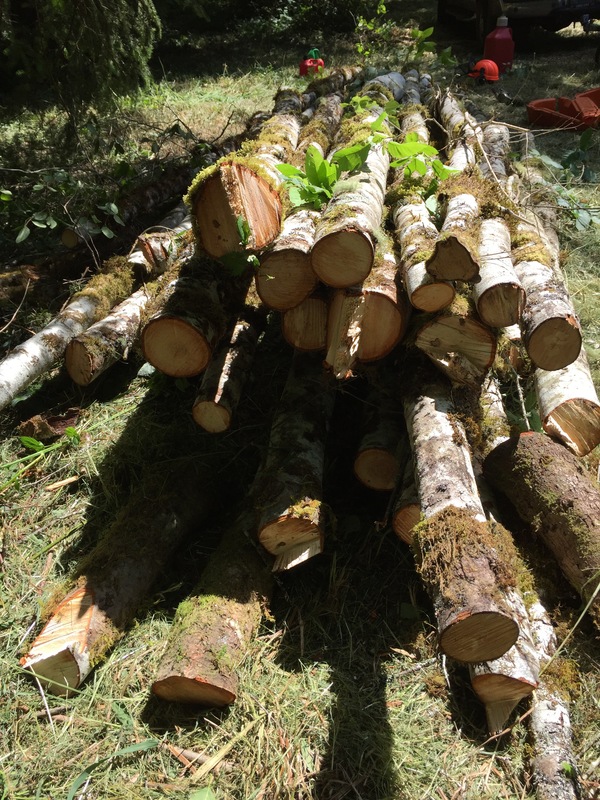 Distance between dominant trees should be between 15-20 feet, and bucking logs in 16″ divisible numbers is handy so we don’t end up with the inevitable “shorty” that makes woodpile management a little harder. Near the end of the day it looks like we did a lot of work if we look at the pile. 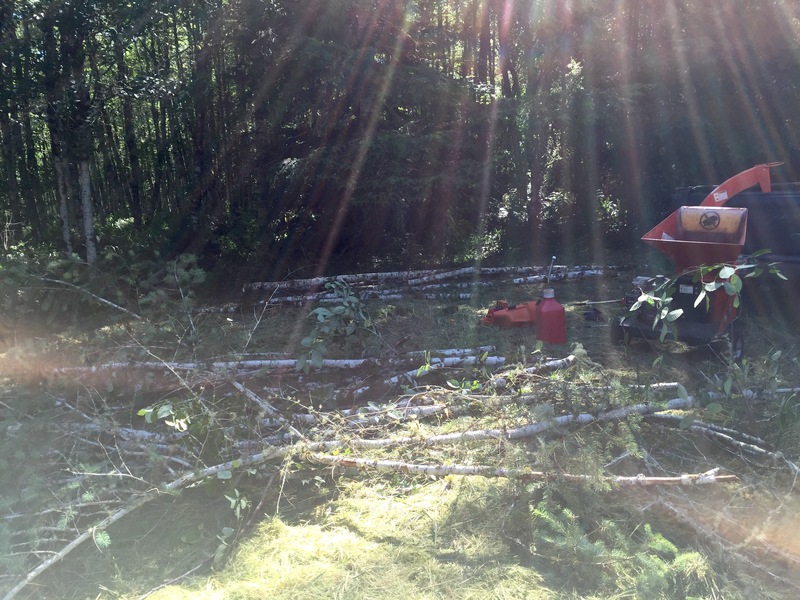 Looking back into the forest shows the need for continuing the thinning operation. The last step is unloading the full truck bed of chips in an area that needs it. 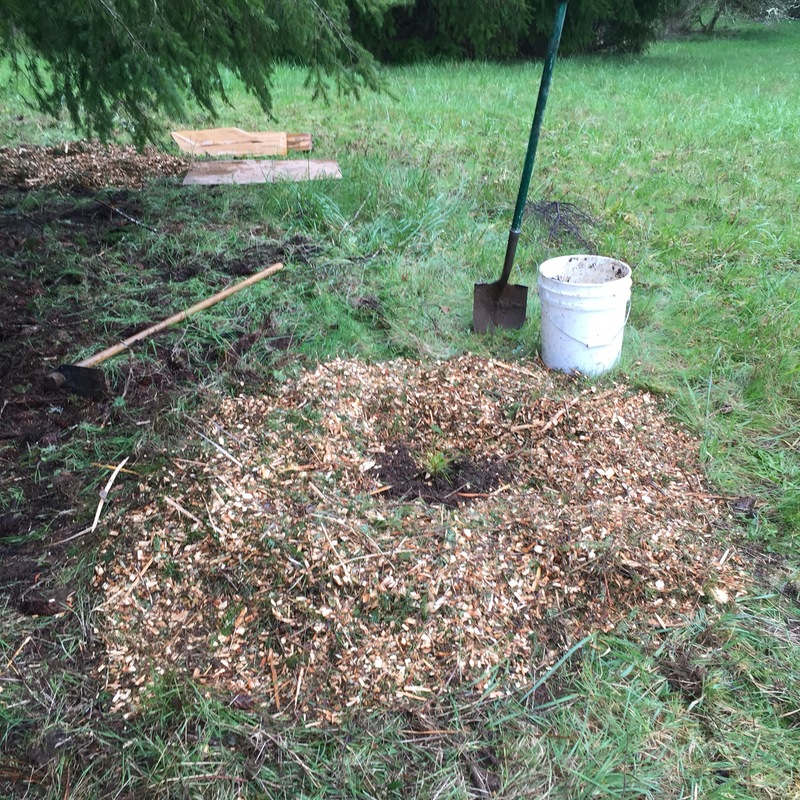 Cistern garden is lacking so we put this pile uphill from the trees it will be spread on. This pile is slow release nitrogen and good fungus development waiting to happen. 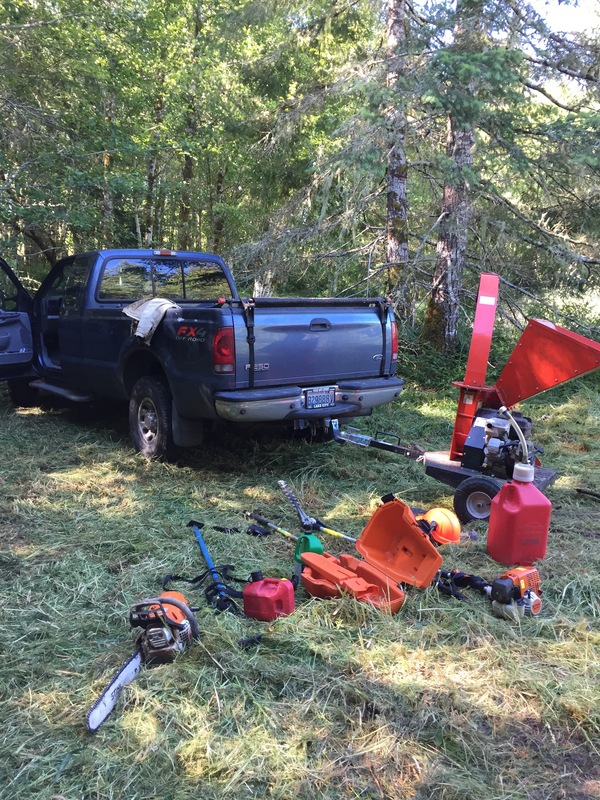 I can probably assume at least two more full time weekends of doing this to get the first of 10 woodlots finished out. I’ve been thinking about a work party for this kind of work, at least the hauling and chipping. A pig roast, a bonfire, some entertainment as a reward for a hard weekend’s work and camaraderie seem like a good trade off. It’s just that this is kind of dangerous so we’ll have to think through the method and planning well before we ever host a party. Remember, when getting a little dirty always wear protection. Safety first! We share the farm with a hefty community. Mice share our little trailer in the cooler months. Bunnies have shared our “invasive” black locust seedlings to the ground. Deer share our apple tree new growth if we don’t discourage it, but sometimes sharing is a little easier. This weekend a chickadee was helping itself to some strawberries. It was persistent and would fly up the the fence and tweet loudly at us. 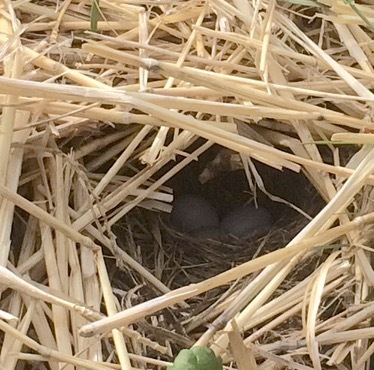 It took a couple of times before I realized it was protecting a nearby nest. After stopping my work to really look I saw that deep mulch beds make a nice home. I think a few strawberries and a fewer mosquitos is a fair trade. Just a quick update, lots of projects in the air and as usual L keeps us on track. Gate: hung and nearly finished. Need to permanently attach the lintel, and hang the glass leaves on the tree. Irrigation: mostly installed but need to finish the last row and my timer is sapping too much pressure from the top row. Mowing: seems like 7 hours in the seat doesn’t go as far as we’d like, and now with extra obstacles the job is more interesting. Tomatoes planted, and cukes and squash and pumpkins. Not on a grand scale but enough to start testing varieties I think. L’s grow room looked like a jungle in Spring. Shower floor update: done! 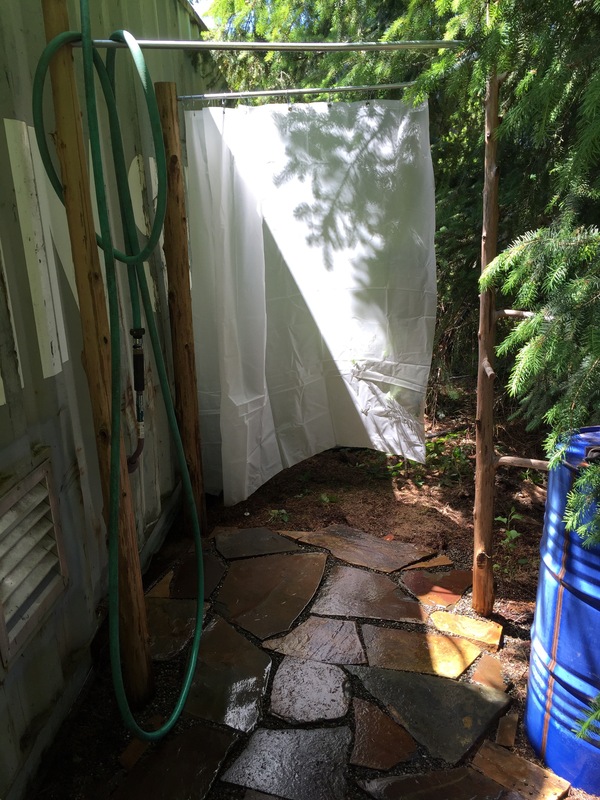 The wood tiles gave up and with the temps running 82 – 98 degrees that outdoor shower is a life saver. News flash. When deer don’t eat trees they bear fruit! We’ll have nectarines, peaches, apples, plums, a few walnuts and one lonely pear. Our lumber package is in the barn and ready to go once we handle the watering and mowing overhead. There are places where the grass is taller than me. While planting Korean nut pines I began to think about the long term perspective our project requires. These trees might be productive in ten years. By then we’ll know if we should invest in more trees or mechanical shelling hardware. 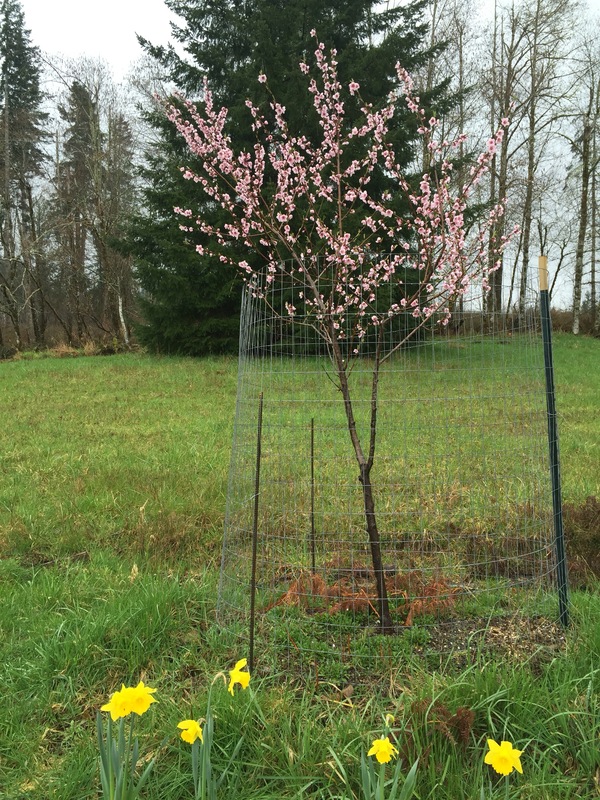 We also planted paw-paw, hardy almonds, peaches, apricots, persimmons, and more plums. 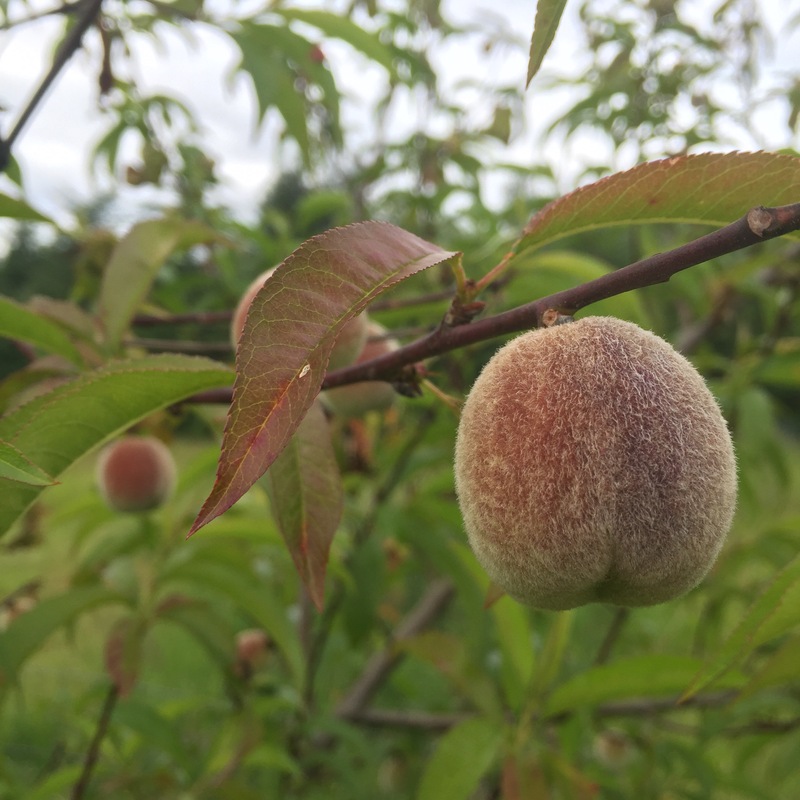 Since things are getting hotter every year the almonds, peaches and apricots are an experiment we think will pay off. 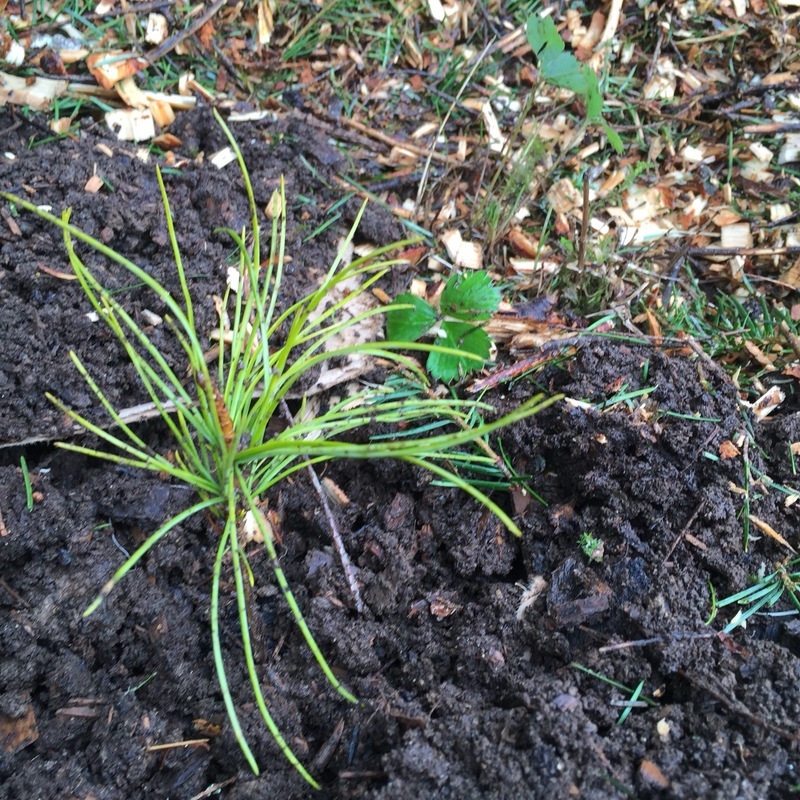 Here is how I’ve thought about the pine nut miniature forest succession. The nut pines are easily sunburned when they are young so I’ve limbed up two Doug Firs in a pasture to give some sun access just inside the drip line. Hopefully this will serve like an eave on a passive solar house letting sun in on winter days and shading when the sun is higher in the sky during summer. I can always add shade cloth if I didn’t get it right. I then cleared sod just behind the drip line. Rain should be able to ooze downhill from the outer edge. I left a little wild strawberry. They like acid and won’t compete with the roots of the pines. 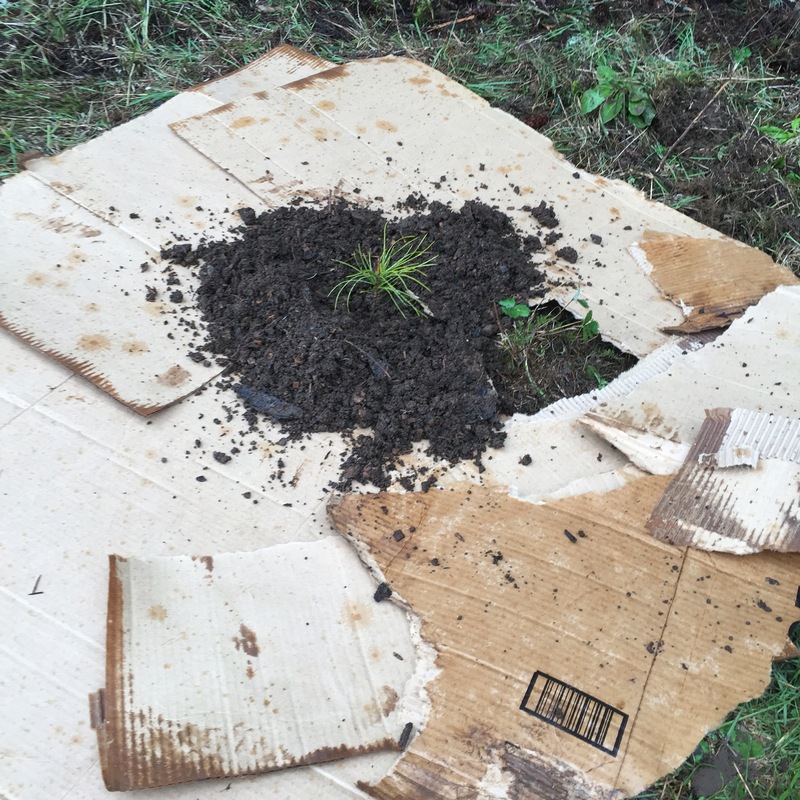 After planting the little guy I topped with compost then cardboard to suppress the grass. Then mulch with chips from the branches I pruned. 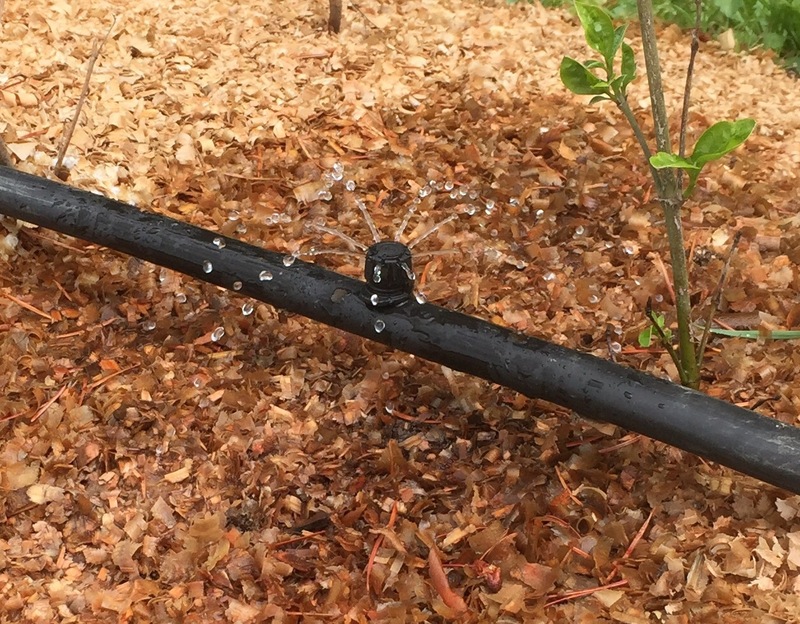 This should keep the soil moist and build a “foresty fungus” in the right place. In ten years three of these guys will be big enough to take over the spot. 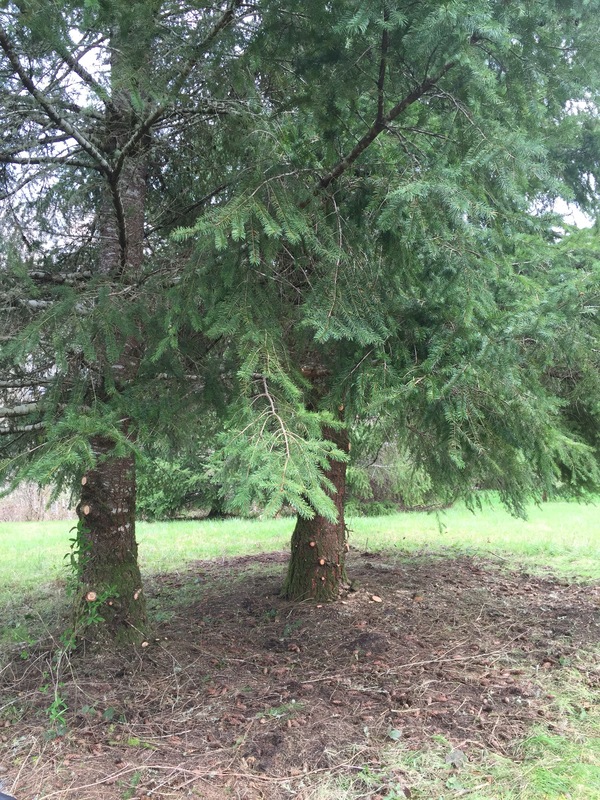 I left a clear spot at the back of the firs to let me drop them without damaging their young neighbors. We will always need lumber so the big firs will have nursed a new generation and will exist in a structure probably protecting animals. You may think this kind of long term thinking is a gamble we may never see the outcome of. 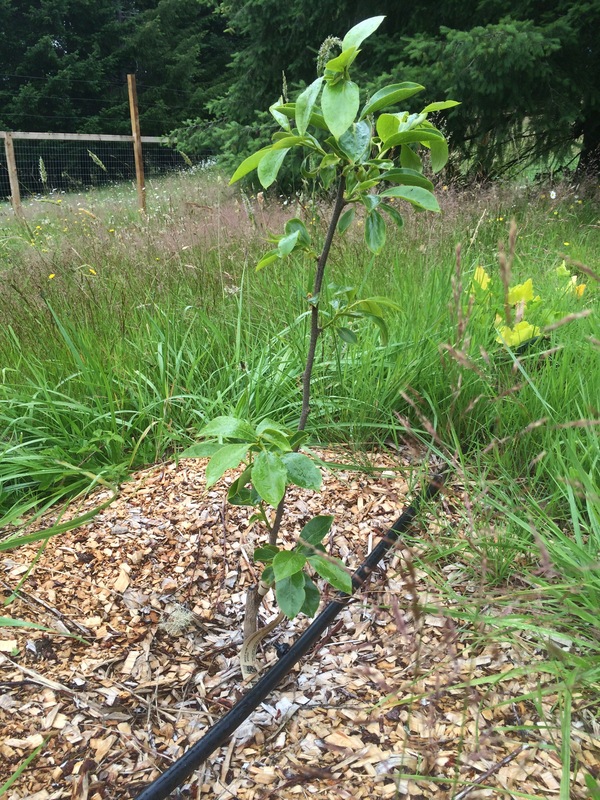 Yet… Three years ago we planted a peach. 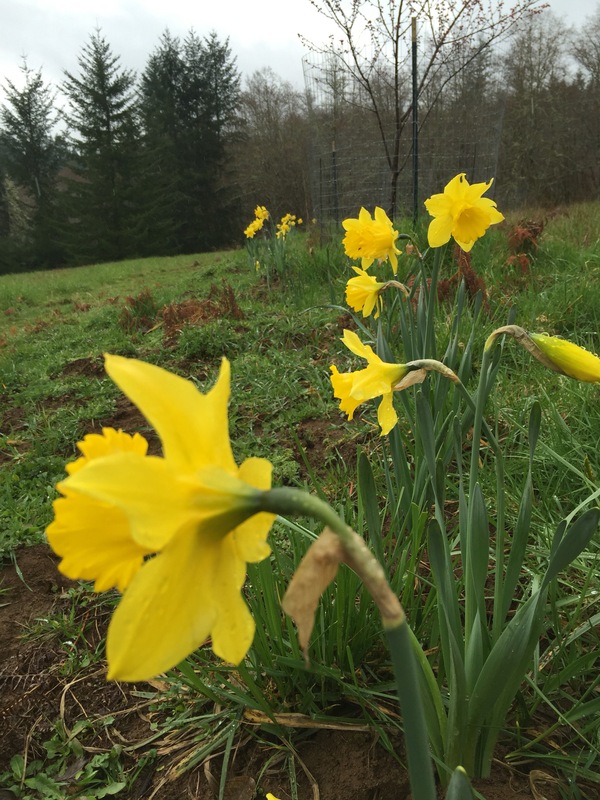 And last fall I planted daffodils when L wasn’t looking. …And today the sun came up, just like we expected it to. Statistically speaking I have maybe 22 years left so I should have enough time left to see some of these experiments mature. Long term thinking is as long as your perspective lets you imagine. Some things we do today will be around for a hundred or thousand years, long after our names are forgotten. Some will disappear tomorrow. I’m ok with both outcomes, I like trying. Just sharing this in case you haven’t stumbled across it yet. I know it’s like “preaching to the choir” posting here but still think it’s well worth sharing. America’s top nutrition thinker tried to unpack the most important food law. It was a mistake. In fall 2011, in an act of what can be described only as hubris, I had the bright idea of teaching a course on the farm bill. For nearly 25 years, I had been writing and teaching about food politics and policy at New York University, and I knew that the farm bill dictated not only agricultural policy, but also such things as international food aid and feeding the hungry in America. It had to be one of the most important laws affecting food systems—if you care about such matters, likely the most important. With the 2008 farm bill up for renewal, I wanted to know more about it, and professor that I am, I thought: What better way to learn something than to teach it? Big mistake. From the minute I started preparing the course, I could see that the farm bill was going to be too big, bloated and sprawling for any one human mind to absorb, certainly not mine. At one point, I tried to catalog the hundreds of programs it covers, each with its own set of arcane stipulations and invested lobbyists. Beyond the obvious—that its agricultural programs are heavily slanted to benefit Big Agriculture—its details defeated me. My students, most of them enrolled in graduate programs in nutrition, food studies, public health, public policy or law, were deeply invested in farm bill issues but they too were soon overwhelmed. The bill not only lacked an overarching vision, but seemed designed to obfuscate how the programs actually worked. I came away from this experience convinced that agricultural policy in our country is not only hazardous to public health and the environment, but also to American democracy. Democracy requires informed citizens. I suspect that few citizens, let alone members of Congress, have the vaguest idea of what is in this bill and how it works in practice. Even lobbyists and congressional staff are likely to know only the pieces they are paid to understand. This is a shame, because the farm bill matters. It is crucial to practically everything about our food system: what crops get subsidized, how much foods cost, how land is used and whether low-income Americans have enough to eat. Whether you are rich or poor, much about your food choices is shaped by what’s in this bill’s 357 printed pages. Given its stunning importance, you might think it would start with some kind of principle. Alas, you would be wrong. On the first day of class, I asked the students to tell me what they thought a rational agricultural policy should promote. They quickly came up with a handful of goals: provide sufficient food for the entire population at an affordable price; produce a surplus for international trade and aid; ensure an adequate income for farmers; provide farm workers with a living wage and decent working conditions; protect farmers against bad weather, volatile markets and climate change; promote regional, seasonal, organic and sustainable food production; conserve soil, land and forest; protect water and air quality, natural resources and wildlife; and raise farm animals humanely. Taken together, they describe a food system designed to promote the health of people and the planet. A vision as idealistic as my students suggested would be a tall order by any standard, but the 2014 farm bill doesn’t even come close. If you examine how its incentives line up, you quickly see that it strongly favors the industrial agriculture of the Midwest and South over that of the Northeast and West; methods requiring chemical fertilizers, pesticides and herbicides over those that are organic and sustainable; and commodity crops for animal feed and ethanol rather than “specialty” crops (translation: fruits and vegetables) for human consumption. Because its benefits are proportionate to production levels, it promotes crop overproduction. This makes food hugely competitive and forces the manufacturers of processed foods and drinks to do everything possible to encourage sales of their products. The result is a food environment that encourages overeating of highly caloric, highly processed foods, but discourages consumption of healthier, relatively unprocessed foods. As a result of today’s intense public and professional interest in food issues, we now know a lot about how social forces drive food decisions. We know that overeating leads down the line to ballooning health care costs; we know that industrial farming depletes the soil and water that will someday be needed to feed our grandchildren. If you were to design a national food policy based on public health, it would be the antithesis of the farm bill. How did this happen? Politics, of course. THE CURRENT SITUATION can be traced to decisions made by Congress in 1906. That was the year Upton Sinclair wrote “The Jungle,” a muckraking account of Chicago’s meat-packing plants. With an urgency that seems incredible in the light of today’s partisan government, Congress immediately passed two laws dealing with food safety and assigned their regulation to the U.S. Department of Agriculture. The USDA put one of its departments in charge of the law dealing with animals and a second department in charge of the law dealing with adulteration of food products. The second eventually became the Food and Drug Administration, which moved its public health functions to the Public Health Service. But USDA ran the food stamp program and, when no other agency wanted dietary guidance, took it on as well, thereby causing endless conflicts between USDA’s historic mandate to promote industrial agriculture, and its newer mandate to advise the public about diet and health. The farm bill focuses mainly on the meat-and-dairy mandate—production of animal-based foods and the commodity crops that feed animals and yield ethanol. For the health and sustainability functions it acquired later—regulation of organic agriculture, development of dietary guidelines every five years (jointly with the Department of Health and Human Services), publication of food guides for the general public andoversight of food assistance to low-income Americans—the USDA can be a most uncomfortable home. Organic production methods, for example, are not merely an alternative way of growing food. They constitute an explicit critique of industrial farming: They reject chemical fertilizers, pesticides, herbicides and genetic modification. For years, the USDA websites included a dismissive disclaimer that organic production methods were no better than conventional methods, despite their well-established benefits for soil quality. It no longer uses that statement, but its Organic Standards Board—which sets the rules for what can be marketed as “organic”—is under constant pressure from large agricultural producers to weaken restrictions on which chemical “inputs” are acceptable; this would allow companies to use industrial methods but sell products at the higher prices claimed for organics. USDA’s attempts to achieve détente between organic and GMO producers have gone nowhere to date. The most blatant conflicts of interest, however, show up in the USDA’s dietary advice. For years, the Dietary Guidelines have induced the wrath of lobbyists whenever they implied that eating less beef would be a good way to reduce consumption of saturated fat. Last year, the 2015 Dietary Guidelines Advisory Committee caused a firestorm when it suggested that meat-eating was environmentally unsustainable, given the disproportionate contribution of farm animals to greenhouse gases and climate change. Pressure by meat industry lobbyists got Congress involved and forced the USDA and HHS to announce well in advance that the Dietary Guidelines would not even mention the word “sustainability,” as indeed, they did not. The guidelines do, however, suggest eating more fruits and vegetables, advice that the USDA repeats in its MyPlate food guide for the general public. This guide illustrates the idea that half the plate—50 percent—should be fruits and vegetables. But USDA’s farm bill policies have historically allocated less than 1 percent of farm support funds for promoting these foods, with nearly all of the remaining 99 percent used to support commodity crops. The 2014 farm bill, although increasing allocations for organic and fruit-and-vegetable production and marketing, still does so at a token level. If you were to create a MyPlate meal that matched where the government historically aimed its subsidies, you’d get a lecture from your doctor. More than three-quarters of your plate would be taken up by a massive corn fritter (80 percent of benefits go to corn, grains and soy oil). You’d have a Dixie cup of milk (dairy gets 3 percent), a hamburger the size of a half dollar (livestock: 2 percent), two peas (fruits and vegetables: 0.45 percent) and an after-dinner cigarette (tobacco: 2 percent). Oh, and a really big linen napkin (cotton: 13 percent) to dab your lips. Recently, the Physicians Committee for Responsible Medicine, a group opposed to eating foods of animal origin, filed a lawsuit against USDA and HHS because the Dietary Guidelines had dropped advice to limit consumption of dietary cholesterol, for which eggs are the largest source. The lawsuit alleges that much of the research behind that decision was paid for by the egg industry, which obviously has a vested interest in encouraging people to consume more eggs. Since the mid-1960s, the American political system, divided as it is by urban and rural regionalism, hasn’t ensured enough votes in Congress to pass either farm supports or SNAP as bills on their own. Logrolling unites them in a “You vote for mine and I’ll vote for yours” marriage, an unholy alliance that neither Big Agriculture nor advocates for the poor can afford to see changed. One result is that SNAP, whose nearly $80 billion budget makes it by far the largest of federal food assistance programs, encourages participants to use their benefits to purchase whatever foods they like, regardless of health consequences. Politics makes strange bedfellows, and both the food industry (for reasons of profit) and advocates for the poor (for reasons of politics) want to keep it that way. Perversely, SNAP can even provide an incentive to drink sodas. Because purchases made with SNAP dollars are not taxed, the program effectively reduces the cost of sugar-sweetened beverages in states that tax such drinks. The cost discount doesn’t apply to healthier untaxed foods. In contrast, the much smaller WIC program provides for purchases of a specific package of foods, all of them healthy. In creating WIC, Congress required research on its effectiveness. This research consistently demonstrated health benefits from the WIC approach, and program advocates have managed to stave off most attempts to junk up the WIC package. LINKING AGRICULTURE POLICIES to health policies would help to resolve these conflicts, and leading commentators on our food system such as Michael Pollan, Mark Bittman, Ricardo Salvador and Olivier de Schutter have called on the president and Congress to create a national food policy, something we don’t have—but badly need. They’ve offered specific suggestions for what such a policy would entail. They point out that unless we pay much closer attention to the way agriculture is linked to diet, public health and the environment, our society will continue to suffer from widespread obesity, food insecurity, chronic disease, soil degradation and food safety scares, as well as the abandonment of rural America. That the farm bill requires reform is a given. How to reform it is quite another matter. In light of the current lack of bipartisan efforts to govern, starting from scratch on the Farm Bill is beyond contemplation. Even piecemeal efforts to tweak existing programs toward fruit-and-vegetable support run up against political resistance. The only hope I see for meaningful change is grass-roots advocacy—a uniting of the many groups working on farm bill issues to create one loud voice for improving the bill, program by individual program. 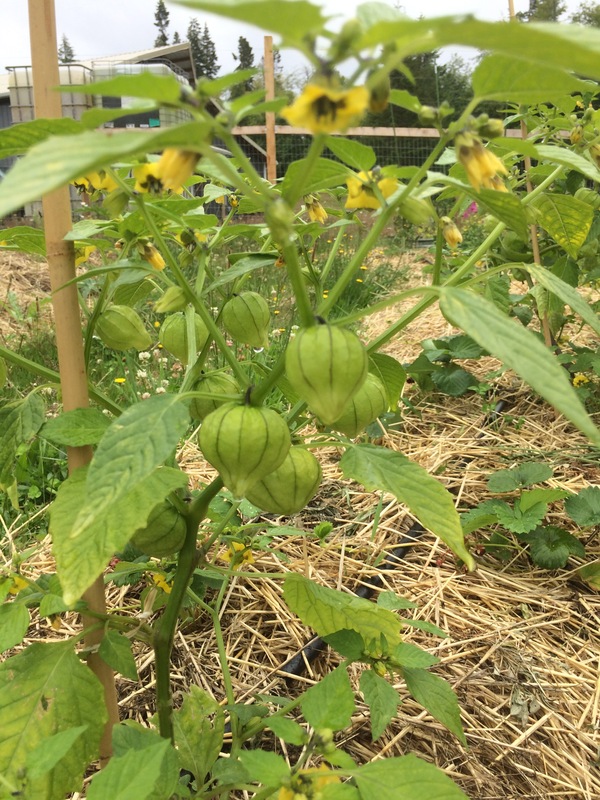 That’s the real reason I taught the class: to encourage students—the future of American democracy—and future participants in the food movement to get political and advocate healthier and more sustainable food policies. The food movement has one enormous advantage for anyone who wants to advocate policy change: everyone eats. Food is the easiest way of explaining to fellow citizens how conflicts of interest in federal agencies, corporate contributions to federal officials or food-industry funding of research can affect their lives. Thousands of grass-roots groups throughout our country are working to promote local and regional foods, farmers’ markets, urban farming, farm-to-school programs, animal welfare, farmworkers’ and restaurant workers’ rights, and to increase food security for everyone. These groups continue the long and distinguished history of social movements in the United States, and are part of the tradition that brought us better civil rights, women’s rights and environmental protection. They are our hope for a counterweight to Big Agriculture, although still relatively weak, they are growing in power and influence. Farm bills are up for consideration every five years or so. We need to start work on the next one right now.